We’d love your help. Let us know what’s wrong with this preview of Enjoy the Poodle Skirt by Kate Willis. To ask other readers questions about Enjoy the Poodle Skirt, please sign up. An adorable, highly atmospheric short story. Three homeschooled siblings volunteer to help their uncle and aunt run their '50s-style diner. They stumble onto a mysterious map and set up a clever contest to find the mapmaker. My friend Kate did a great job building the world of the story and setting up its brief plot arc. I only wish it was longer, because the main character and her siblings are sweet kids; it warms the heart to read about people like them. Maybe she'll bring them back in a longe An adorable, highly atmospheric short story. Three homeschooled siblings volunteer to help their uncle and aunt run their '50s-style diner. They stumble onto a mysterious map and set up a clever contest to find the mapmaker. My friend Kate did a great job building the world of the story and setting up its brief plot arc. Fun, retro-feeling short story, set in a diner. Young Canary and her family are pleasant characters, and this is the sort of story the whole family is sure to enjoy. I’d have preferred a few more descriptions of the people in the story, so they were left a trifle faceless in my imagination, but everything else is well described, and the story comes to a pleasant close. I love the ice cream shop, it was so sweet and chill! ;) Adorable story and nice message. This is such a sweet, awesome little mystery! The characters were interesting, the plot was intriguing, and then end was awesome! An awesome read, and it was quick to finish as well! This was an adorable short story! So so sweet! I read it in about an hour, so it is not very long, but is such a simple, wonderful story nonetheless. This would make a great read aloud for children, but is still enjoyable for older peeps. A cute story told in a writing style with a lot of personality. I wish I could visit this '50s diner and know this delightful family. (Canary's name is adorable!) The little mystery kept me wondering until the end, and I really liked the conclusion . . . the mapmaker is like several people I know. (I can't say more lest I give something away.) Just the fun, atmospheric little story I needed when I read it. Another sweet little story! I'll have my Addy-aka little sister-read this sometime, she'll like it a lot! "Enjoy the Poodle Skirt" by Kate Willis is a delightful short story. It was small enough that I read it in a half hour, but it packed in a lot of sweetess and fun in its short length - especially in the characters and setting. I enjoyed the main character and each of the other characters. The 50's-style diner setting was vivid and charming, and the food made my mouth water. The mystery element was simple yet sweet. 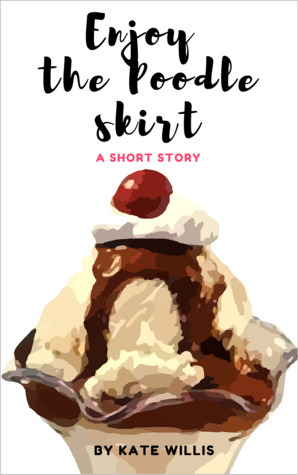 The whole story made me smile and gave me a warm feeling of sweetness and old-fas "Enjoy the Poodle Skirt" by Kate Willis is a delightful short story. It was small enough that I read it in a half hour, but it packed in a lot of sweetess and fun in its short length - especially in the characters and setting. I enjoyed the main character and each of the other characters. The 50's-style diner setting was vivid and charming, and the food made my mouth water. The mystery element was simple yet sweet. The whole story made me smile and gave me a warm feeling of sweetness and old-fashioned fun. After reading a wonderful novella by Kate, I've been looking forward to reading this short story, and it didn't disappoint. I look forward to reading her future works as well. I recommend this sweet story, "Enjoy the Poodle Skirt," to all readers of all ages - children, teens, and adults - especially those who enjoy historical or contemporary genres. This is an adorable short story. Its part mystery, part sibling adventure, and one-hundred present fun. The setting of a 50’s style diner was so much fun! I wanted to visit this place! It actually made me think of a place that I had visited in Fredericksburg, Texas (though this diner sounded even more fun). Reading this will probably make you hungry for a burger and milkshake. Canary and her siblings are great characters. I love how they work together to try to solve a mystery. It isn’t a scary mystery or a big one, but it is fun. I love how the siblings look out for each other, even in a small way. I highly recommend this story to those who like short, contemporary stories with hints of mystery, and happy siblings. I knew when I first saw the cover I'd like this book!!!!! :D And I really did! I loved how a small mystery was tied throughout, and the vintage stuff!! Ahhh, I loved it! Poodle skirts are my weakness! ;) All those ice cream floats, etc, sounded amazing too!! Genuinely written and creatively told, Enjoy the Poodle Skirt is a darling read for anyone and everyone. Kate Willis’s tangible writing style bled through every passage and I was immediately drawn in. (Also the names were awesome—Canary especially!) Despite its shortness, she still managed to develop the characters and the setting incredibly well—preparing the scene for the lighthearted mystery which, while not heavy or too suspenseful, added a fun tone to the story. Overall, it was short, sweet, and full of fun and ice cream! Okay, this was super-cute! Just a fun, summery kids' story about a week of vacation and an old-fashioned diner. :) Even the mystery wasn't as much of a we-need-to-solve-this type as just something interesting to wonder about and keep an eye out for. Perfect story for a quick, fun read. This was so cute! It was a really fun short story, and it was so sweet! I loved the little bit of mystery and the ending--so great. A lot of short stories that I've read feel kind of rushed, like I needed more time to get to know the characters, but this one worked perfectly. I got to know the characters pretty well, and it was a fun, sweet story (pun not intended). This is the first book I've read by Kate Willis, and I immensely enjoyed the writing style. I look forward to reading more! *I recei This was so cute! It was a really fun short story, and it was so sweet! I loved the little bit of mystery and the ending--so great. A lot of short stories that I've read feel kind of rushed, like I needed more time to get to know the characters, but this one worked perfectly. I got to know the characters pretty well, and it was a fun, sweet story (pun not intended). This is the first book I've read by Kate Willis, and I immensely enjoyed the writing style. I look forward to reading more! This was a really fun, cute story. It would be great for six through eleven year old's, but I, as a seventeen year old, enjoyed it to. I wish there was a dinner like that around here, it would be super cool. I needed something quick to read before bed and remembered this one on my kindle. I decided to try it out and I'm so glad I did. Each of the characters are quirky in their own way and I think they each fit the time period. Most of the dialogue was the Canary talking and she has a super fun personality. I really liked it. The plot was short and sweet just as it should be in a children's short story. I didn't see any problems it it, either. I didn't see any typos in the book and the writing never took me out of the story. It took me about fifteen minutes to read it in total, so it would have been hard to put down anyway, but even if it had been longer, I still wouldn't have put it down if I didn't have to. Willis keeps the flow steady and holds your attention with cute descriptions of the diner and outfits that have to be worn, even to the naming of the embellishment on her skirt. (I wish there was a diner like that around here!) I did get the vintage feel of the place, and felt the enjoyment that the characters were Wow! What a surprise I found in this deliciously, delightful mystery book. Enjoy the Poodle Skirt by Kate Willis is an exceptionally written story for the older elementary age reader. A sweet, enjoyable children's story. My only complaint was that this was a short story, it could easily be enjoyed as a full length book! And I loved it that the restaurant had a 1950's theme! An adorable short story. Perfect for anyone with a sweet tooth or lovers of old-fashioned diners. Has a fun mystery, too! This story was as sweet as the ice cream the characters served. A well-written, quick read, appropriate for all ages. A sweet fun story with a dash of vintage flair, happy sibling moments, and a fun search. I wanted to know the story mentioned... and it also struck me as a bit odd that the main character had an unusual name while all of the other characters, including her siblings, had very common names. Nevertheless, this didn’t affect my enjoyment of the story; I’d highly recommend it. Whimsical, light, fun, and happy, Enjoy the Poodle Skirt is just what a story should be. A sweet little story. The cover is my favorite part, though - SERIOUSLY eye-catching and beautiful. Kate Willis's middle-grade short story, Enjoy the Poodle Skirt, is the tale of Canary and her siblings, who have gone to spend the week working at their newlywed aunt's vintage diner. But when an oddly titled map finds its way into Canary's hands, she is determined to find its owner... and solve the mystery that is at large. My, what a fun, fast-paced, delightful little tale this was! It brought me back to summers in which my bestie and I would go to my grandfather's house and ride quads, practice archery, go jar "fishing," and, of course, eat ice cream! (Now I want to write a short story of my own... and wear a poodle skirt!) Four stars! “Moments later as we crossed the road to the 50’s diner, I recited the restaurant rules in my head one more time.